Blog covering matters of related interest. This is a fixed width, center aligned, standards compliant & accessible website. The multi column layouts are accomplished purely with 'floats' - tables are only used for displaying information on books and similar data that should be presented in tabular form. 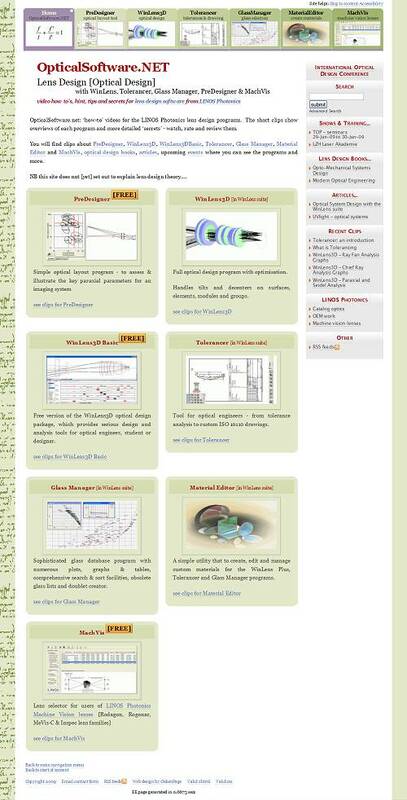 Other resources of interest to optical designers can be found on this site. The site is owned a registered osteopath, who came across the device after a severe cycling accident. So impressed was he by its effects that he became the UK distributor. Thanks once again for delivering the goods at what was unreasonably short notice on my part. Content just as requested but with your own subtle embellishments. The site is a simple static website, center aligned of fixed width. As always it is standards compliant and designed to be accessible. 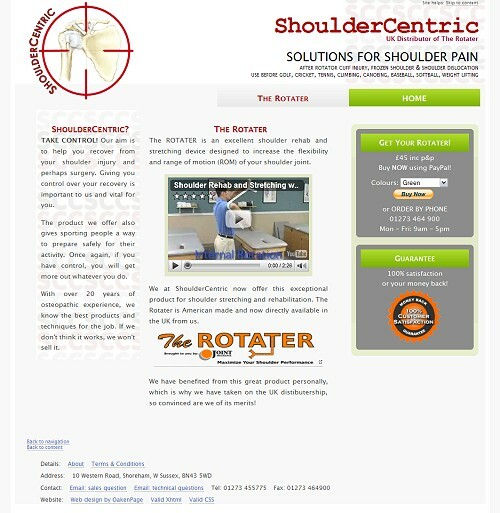 The site displays a number of video clips to show how to use the Rotater. 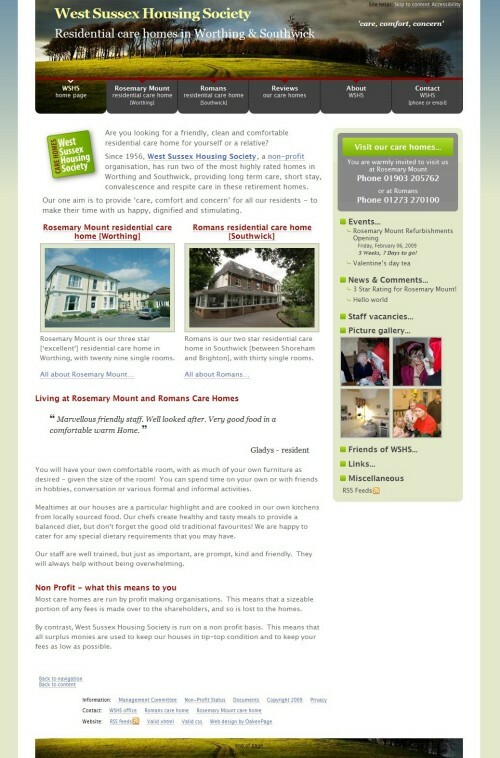 West Sussex Housing Society runs two highly regarded residential care homes West Sussex; Rosemary Mount in Worthing and Romans in Southwick. The society was formed in 1956 by local members of the Rotarians, and has been providing care since then. The Society required an attractive and informative site that reflected their local links, providing full details on their facilities to potential residents and their families, showing career opportunities to prospective staff members, and was easy to update by the office. The header photo is of Chanctonbury Ring, a local landmark. The whole site is run by ExpressionEngine CMS, so that the housing socity can update the website at their leisure. A photogallery provides an up to date record of life in the houses..
Kay needed a site to announce the violin side of her work, to display upcoming events, to list the growing number of approved teachers and to sell teaching materials to other teachers and to parents. This is a fixed width, left aligned, standards compliant & accessible website. The multi column layout on the home page is accomplished purely with 'floats' - tables are only used for displaying prices on the materials page. The header photo is actually of one of the young violinbabies in action - the colour scheme was chosen to go with that picture. The whole site is run by ExpressionEngine CMS, so that Kay can update the events calender and the teacher directory at her leisure. A PayPal shopping cart was used to allow for the on-line purchase of teaching materials. n:vision is a Christian organisation that aims to encourage and enable youth and youth workers in churches in the south of England. I designed and built this website to replace an older frame based site. The aim is to provide timely information [including posters] and on-line ticket sales for upcoming events, information about speakers & bands [including videos], photos of past events and background information about n:vision itself. Thanks very much for the great new website. It looks really professional & is easy to navigate & keep up to date. Your speedy response to the alterations that we wanted made the process hassle free & we have ended up with a website that has all we hoped for & more! The site is driven by the ExpressionEngine CMS - besides handling automatically all the time sensitive matters and the cross links between events and performers, it allows the n:vision team to update the site content themselves - a key requirement. Ticketing is via PayPal, and several different types of ticket can be offered for each event. I decided to use a centered fixed width design for this site, taking colouring and the background from the existing logo. As with all my website, nvision.uk.net is standards compliant and accessible. Stylesheets maintain the graphic design elements over the pages, making it much easier to update. Tables are only used for tabular data, e.g. the tickets on the event pages. 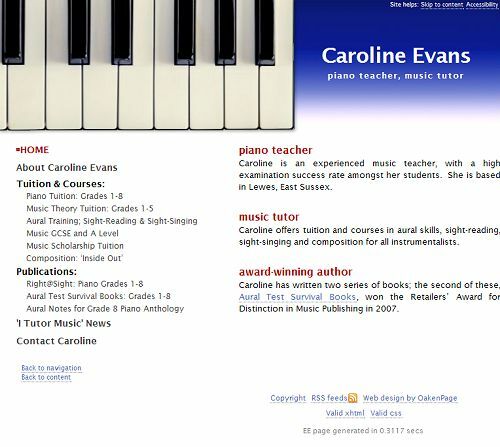 This is a site I designed and built for Caroline Evans, piano teacher and music tutor. She is based In Lewes, Sussex, living in a wonderful house with views over the South Downs. Geoff Adams has set up my first website quickly, efficiently and with a minimum of fuss. He keeps in regular contact so that the client is kept up to date with progress. He is particularly adept at creating links and suggesting ideas to improve the site. He answers all queries promptly and in a friendly and straightforward manner. 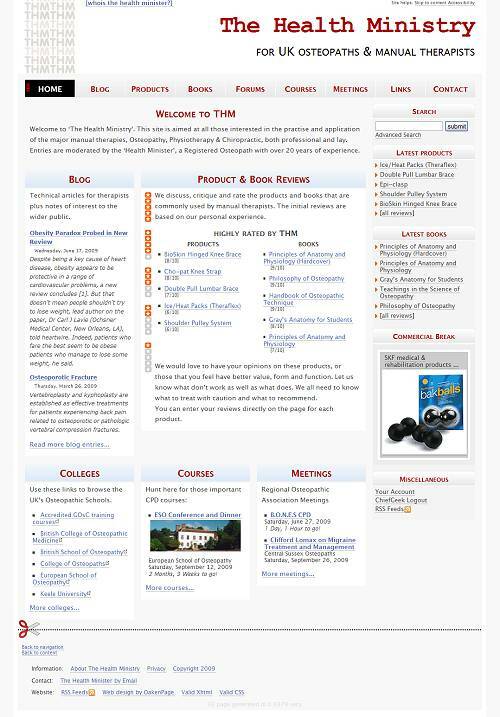 His step by step user guides and user manuals are extremely clear and easy to follow. I would not hesitate to recommend Geoff as a website designer. Caroline wanted a website that reflected her approach to music teaching, direct and straightforward. She also wanted to be able to update the site herself. 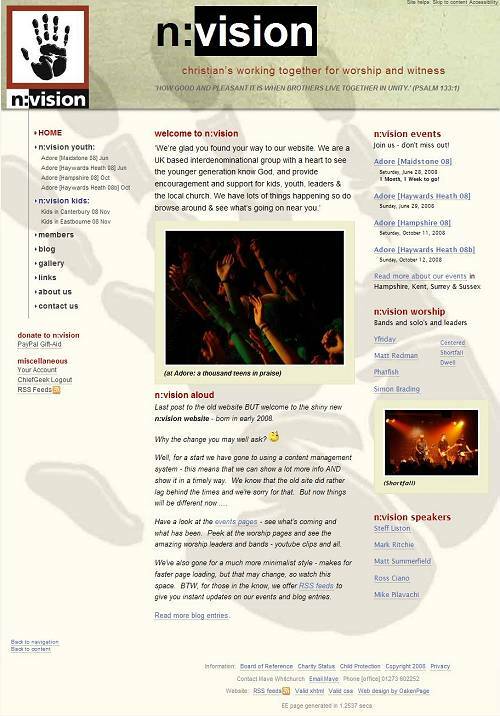 I therefore used the Expression Engine CMS to manage the site, offering both static pages and a blog. Exeter Young Strings is composed of a number of talented teachers of stringed instruments [currently violin, viola and cello] in the Exeter area. Besides offering individual lessons, they also lead chamber groups. E.Y.S starts with children of 6 or younger and goes right through to grade 8. The emphasis of E.Y.S is upon musicality; the individual lessons are essential for getting the basics right, while the players really enjoy the fun and responsibility of the chamber groups - where each member has much more significance than in a full orchestra. Naturally, E.Y.S puts on a number of concerts and other events each year, where the groups and soloists can showcase their talents. As director for Exeter Young Strings I would like to say how extremely happy we all are with the new site Geoff has provided. I have had only positive feedback from our members. In addition I have also been very impressed by the time and effort he put into understanding our requirements and how our organisation runs. Our site is eminently suitable to our needs. The website has an elastic layout - the content will expand to shrink to fit the browser window within certain constraints. As always the site design is determined by style sheets, while the content is managed by the ExpressionEngine CMS. This is the website for a new gospel choir for teenagers in the Worthing, Shoreham & Brighton part of Sussex. The site, obviously, gives key information [who, where, when] about the choir itself. Once the choir has a performance or two under its belt, we will show YouTube videos of them in full swing - for the moment we have videos of famous gospel choirs, to provide a taste of gospel music. If I was given a tenner form everybody who has said our website is amazing and passed it onto you, you would be a rich man. Thanks, thanks again. This site has a fixed width, left aligned design. The navigation is a simple list, and the site, being small, is written in static HTML/CSS. 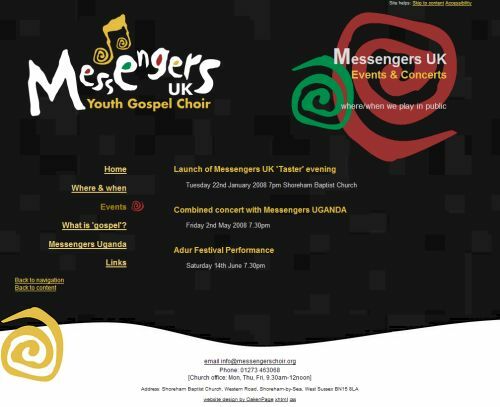 The design was based upon a poster designed for Messengers by Karen Wells - a talented local graphic designer. The poster gave the logo, graphic elements and the colour scheme, which were then adapted to suite the requirements of on-line display. 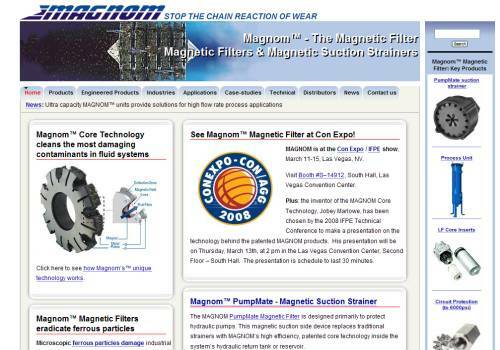 This site is for a leading manufacturer of magnetic filters for industrial fluids. The highly effective filter removes micron scale particles without disrupting the fluid flow. The filter system is used in a wide range of industries and in many different fluids [water, fuel, oils, hydraulic, cutting and coolants] so we not only have datasheet pages on each product, but pages for each industry and application. There are numerous case studies, technical notes, plus contact details for their distributers, news letters etc etc. It is now six months since we went live with our new web site. We have been complemented on numerous occasions from our users on the design, ease of use and professional look of the site. Having viewed the site one customer said “we had transitioned from a company with a technology idea to a technology company???. One of the main critia for the web site was that we needed to inform users of the breadth and depth of the Magnom Technology, which we thought was quite a difficult task considering the number of industrial applications and references we had to include across different markets. I guess the structure and architecture you employed for this aspect has proved very successful as even I can find my way around with ease! The site uses an elastic design, with the main content section have one or two columns. A single main stylesheet manages the site layout - with one or two others pulled in for specific pages. The site relies upon the Expression Engine CMS, in particular the ability to define custom fields for different types of entry. Thus the product page section contains many fields for the datasheet, while a distributor page will have fewer and completely different fields, i.e. you can define the fields for the purpose and are not artifically constrained to a limited set. The CMS makes it possible to have complex relationships between pages without requiring much effort in the way of maintainance. Thus on a product page, you will also see links to relevent industries and applications, plus case studies involving that product. Similarly on a industry page or an application page, you will see links to appropriate products and case studies. Managing all these linkages by hand would be a nightmare indeed! 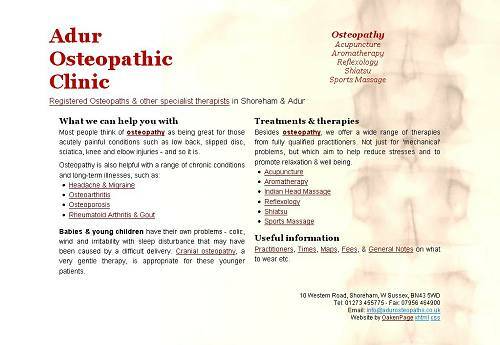 This is a Shoreham based Osteopathic Clinic which offers a whole range of alternative therapies. The site gives lots of background info, as well as times/charges etc. We have found Geoff Adams of Oakenpage extremely helpful, astute and he has put a lot of thought into setting up our web site. Most impressive is the way that he continues to come up with ideas without us having to prompt him. We are very happy to recommend this service! We utilised copy and graphics from existing paper handouts and brochures belonging to the clinic. These provide a lot of information about the various therapies available. Andrew wanted a simple clean design, so we kept colours and font variations to a minimum. The background graphic was taken from an x-ray of the spine and then processed, so as not to overwhelm the text. Catherine Black, a wonderfull cello teacher, runs a variety of cello orientated courses and workshops in Lewes. Some are diagnostic in idea [looking how to improve a specific area] and others are for pure enjoyment. The latter includes 1 and 6 day ensemble courses purely playing lovely renaissance and baroque in company with like minded people. One nice thing is that all skill levels can work together. Geoff really knows what he is doing. He is amazingly fast to respond when I need updates, good-humoured and does extra research to help you develop your site. I have been extremely happy with everything he has done for my site. Geoff has done behind the scenes research for me to help raise the profile of my site. Because he knows what he is doing and I know little but have ideas, together things can really come together. This was a replacement site for Catherine. She had some evocative photographs - which were re-used as backgrounds plus some nice smaller artwork which are thematically linked to specific pages. The design is elastic, with a central content area which contains one or two columns of content. I took the colour scheme from the the main background photograph. At present the site is purely static HTML/CSS. By the way - try googling for 'cello course' or 'cello courses' - Catherine has been ranked 1 for months! The trio is composed of Rosemary Hensor [piano], Rachel Ellis [violin] & Kay Tucker [cello]. 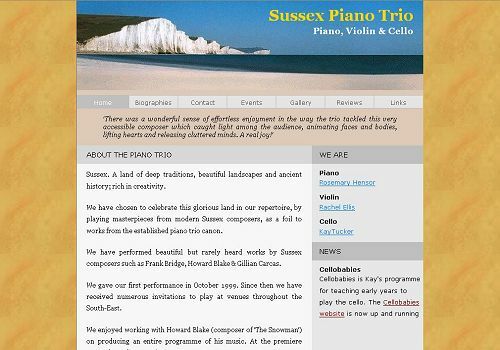 The trio is based in central Sussex and plays a classical repertoire but with strong county connections - thus using compositions from Sussex composers where possible. The design is for a fixed width, centered about the middle of the screen. Navigation is a simple horizontal list. The header graphic - from which part of the colour scheme was taken - is a modified graphic of the 'Seven Sisters'. For those interested, all beaches round about the Sisters are quite stony! Kay is one of the UK's leader cello teachers - specialising in under 6's! Kay has had remarkable results with a teaching method she devised after years of experience with younger cellists. 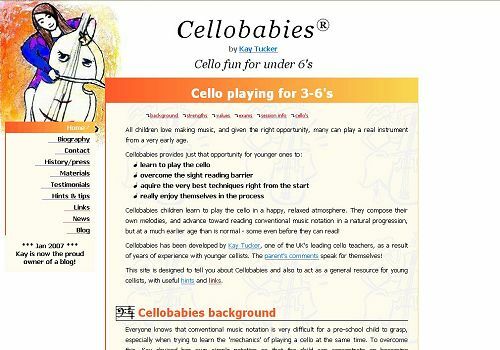 Because the claims seem so fantastic [who could imagine 3 year olds playing], we have displayed a large number of comments and testimonies from parents and past/present 'cellobabies'. 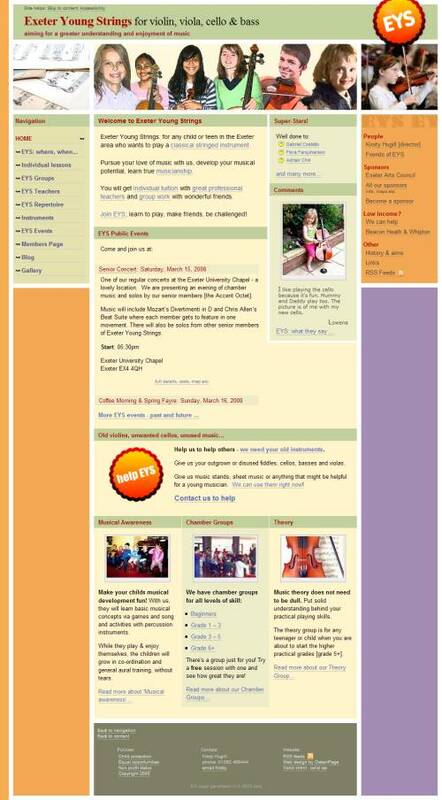 Besides giving information about Cellobabies, the site also details Kays activities as a festival adjudicator. This is a fixed width design, one column wide, with the navigation in a side bar. We wanted a nice bright colour scheme, as befitted the young age of the cellists. The cello girl logo proved really helpful here, providing a good strong orange - picked up in the header gradients. The music theme was echoed in the little graphics used for list items and for h2 headers. The site was originaly purely static HTML [though always standards compliant], bu has recently had a blog [WordPress] added. I created a theme to match the existing site, so it appears seamless. 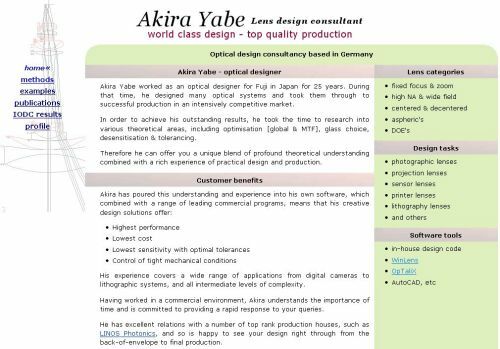 Akira Yabe is one of the worlds leading lens designers - evidenced by his consistant high [or top] placings in the International Lens Design Conference. The site showcases some of his highly innovative design methods, illustrated with examples of his work, along with links to his technical papers. This is an elastic design with one or two columns. The design uses a simple colour scheme with some subtle gradients in the headers [h2 and h3]. Typography is simple - two fonts only. For those interested - the background graphic at top left of each page is a cross section through a 14 element lens, showing some rays being traced through to the film plane. 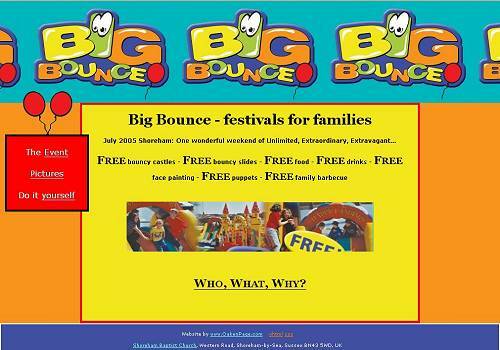 Jolly website about a fun weekend in Shoreham - organised for the community. Lots of free stuff. Logo [bouncing man] and balloons by Karen Wells - excellent graphic designer. Simple fluid design, picking up bold colours in Karen's Logo. Not really much else to say about this one. Of course, this site itself is part of the portfolio. The site is standards based and is designed with accessibility in mind. Since there are a number of different skins available, we can't say much about the layout [fixed, fluid or elastic; one, two or three column; position & style of navigation etc] as that differs radically from layout to layout. This site is dynamic, i.e. database driven. We use the ExpressionEngine CMS to manage the site - and would recomend that system to anyone!